Make America Great Again with this classic Mr. 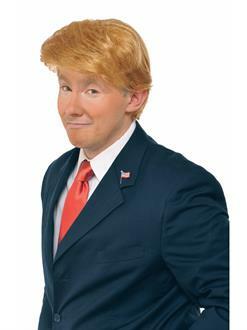 Billionaire President Wig from Costume Supercenter! You don’t have to worry about styling your hair again when you order this wig, even the president would be impressed by how long your hairstyle lasts. Even after a long night of campaigning and Halloween fun, you can count on your hair to be the center of your costume. Order today! Includes (1) Wig.